Country farmers aren’t the only ones raising chickens anymore. People in urban and suburban areas are now raising chickens as pets so they can have their own fresh eggs. They essentially create a backyard chicken farm. Many believe that chickens are beneficial in a variety of ways. For starters, chickens eat yard and garden bugs and pests. They may fertilize your yard or garden and they are low-maintenance. 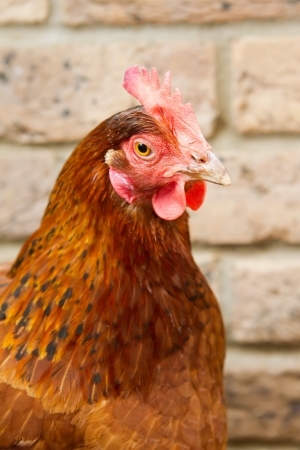 These are all wonderful aspects of chicken ownership, but there are responsibilities, too. They are animals and so need to be feed and watered every day, and their coop or area needs to be cleaned regularly – not much different than any other pet. However, unlike some other pets, they can be an economical pet that pays their way by saving you money on eggs. Chickens lay eggs in spring, summer and fall and you should be prepared to gather eggs once or twice a day. Not every chicken will lay every day, but by the end of the week, you should have plenty of eggs to feed your family. They will continue to lay eggs for 3-5 years. Check with your city or community for laws or ordinances for chicken farming. In most neighborhoods, roosters are prohibited and sometimes even illegal for the obvious reason that they create a noise problem with their crowing. Some communities might prohibit the chickens or the type of coop that you construct. And some communities require that you sign an agreement before owning a backyard chicken farm. Chickens are social creatures and that means that they need to be with others in a flock. Most people own four or more chickens at one time. To ensure that you purchase healthy, non-diseased chickens, buy your baby chicks from a source that has high standards. Diseased chickens can quickly pass the illness to the rest of the flock. Chickens can be easy to have if you follow some guidelines for their care and feeding. You will need to have a chicken coop that protects your chickens from predators including neighborhood dogs and cats. 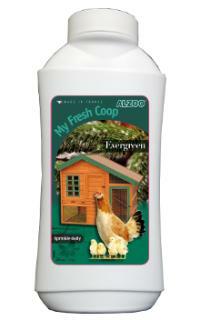 Your coop needs to have a place for feeding and watering your chickens and needs to be clean and dry. Chickens will eat things that they dig up in your yard, but for healthy chickens, you will need to purchase commercial feed that has nutrients to ensure their diet is sufficiently healthy. If you’re worried about the smell your chickens or chicken coop might produce, Grateful Pet can deliver Alzoo My Fresh Coop Evergreen Chicken Coop Deodorizer right to your door. You simply sprinkle the evergreen-scented deodorizer across shavings or bedding between cleanings to keep your chicken coop smelling clean and fresh. Chickens comes in a wide variety of breeds. Some are better egg-layers than others. You will also want to determine which of the breeds is best for your climate. Some are more cold-hardy than others, so you will want to make sure your chickens are adapted to winter weather if you live in a place where winter is cold, snowy, and icy. Another aspect of chickens and their eggs is that eggs come in different colors! People usually name their chickens and enjoy holding and petting them much like any other type of pet. They can even be trained. But like all other animals, they have behaviors that mean they must be handled with care and caution. Experts are quick to inform potential owners that chickens can peck at eyes and to be careful to hold them with their heads away from your face. That being said, potential owners have a plethora of information available to them. Many, like the website My Pet Chicken, will provide all the information you need to maintain a healthy flock. You can also find stories, articles, and essays that describe life with chickens, so you will know what to expect when you begin your chicken adventure. One friend, who we lovingly call “the chicken lady” loves each of the hens she has, each with a name that fits the hen’s personality. She tells stories about them and shares pictures on Facebook and in texts like every other pet owner does with their dog or cat. Fact is that we have found most chicken owners also have other pets in the household. Indy’s Pet Food Delivery Service supplies a variety of products for many different animals including gerbils, hamsters, ferrets, horses, chinchillas, reptiles and cats and dogs. Grateful Pet provides free delivery to the metropolitan Indianapolis area and has been a nominee for the 2016 and 2017 Best Pet Supplies on the Indy A-List. Visit the Grateful Pet website to see what products we can deliver to you.